I don't know about you, but I get a little confused by some of the food labels these days. My eye tends to gravitate toward things that say organic, natural, hormone-free, but what does it all really mean? Below is a list I have compiled that may help decipher all of the packaging we are faced with each day. Conventional - product or produce is made conventionally with commonly used pesticides, chemicals, herbicides, fungicides, etc. Transitional - product is working toward certification process and is in the three-year period where they are meeting organic standards in practice but cannot be certified until the land or the products produced form produce or wheat from that farmland have been in practice for at least three years. This helps ensure that the chemicals previously used are dissipating for the soil. Farmland used to grow the produce must be free of chemicals (pesticides, fertilizers, etc) for at least three (3) years. During the three year period, they are considered "transitional" and before that they were simply conventional. 100% Organic - exclusively organic ingredients or single ingredient products like eggs, fruit or vegetables. These items can carry the USDA Organic seal. Organic - 95% of the product is made of organic ingredients (excluding salt and water). These items can carry the USDA Organic seal. Made with Organic Ingredients - ingredients are 70 - 95% organic; organic ingredients are specified on the label. Less than 70% Organic - product has some organic ingredients but less than 70%. Natural - does not mean organic; natural simply means that there are no artificial flavors, colors or preservatives in that product and that it is minimally processed. All produce and one ingredient items like eggs, beef and chicken are "natural" so this means almost nothing. Free Range - does not equate to organic. Usually used for poultry or eggs, this means that they have some access to roam. This does not necessarily mean outdoor pasture. Hormone-Free - does not mean organic. The animals were not given hormones, like growth hormones, usually applies to dairy cows and cattle. 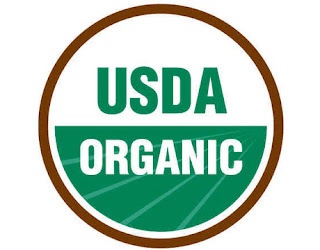 Certified Naturally Grown - The Certified Naturally Grown label is used on items produced on smaller farms that grow using USDA Certified Organic methods and sell locally; it's like USDA Certified Organic Lite. This non-profit labeling program does away with the high cost of certification and the mountains of paperwork required to track crops from seed to sale in order to be labeled USDA Certified Organic. Small-scale farmers that use this eco-friendly label do so to emphasize the natural farming methods used to grow your food. Fair Trade Certified - The Fair Trade Certified label helps to ensure that farmers are paid fair, above market prices for their products. It also guarantees that farm workers are paid fairly for their labor. Buying Fair Trade Certified employs sustainable farming practices, which protects everyone's health and helps preserve valuable ecosystems for future generations. Look for this label on coffee, teas, chocolates, bananas, sugar, cocoa and even honey, as well as imported commodities.